In the first six league games of the season we had just three draws, but we should have been able to hold on to win at home to Crystal Palace when they equalized five minutes into added time, and we could have even got the win at Aston Villa, but we didn’t and we were joint bottom with Burnley, after the 1-0 loss at Stoke. If we had managed to get those two wins we would have been around 14th – still not too high up the league – but not joint bottom either. And of course he’s right, because whatever the reason, Newcastle fans always have a big reaction to the result – be it a win or a loss – things are just great when we win and things are just terrible when we lose. So a run of defeats and the sky is falling in – and a runs of wins and everything is beautiful in the Newcastle garden. That’s the way it’s always been at Newcastle, and maybe it’s just the passion of the fans that causes that? The big confidence factor is that we have seen some of our youngsters and fringe players show they can play a bit over the last few games , although losing Obertan was a bit of a blow last weekend. Alan has done most things right in the last four games, and he completely changed the game in Newcastle’s favor at Tottenham at half time, and then how we managed to beat a strong Manchester City side away, we still don’t know – it was simply a terrific performance from our lads. And the tactics were spot on against Liverpool, although it was still anybody’s game before young Ayoze Perez scored in the second half. 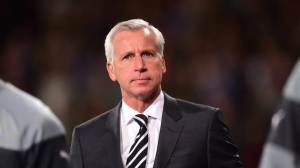 But Alan still has many detractors at Newcastle, and he has to get some stability with results, because we seem to have very good runs and very bad runs with Pardew in charge. In the season we finished 5th we had six league wins in a row, and last season we had six league defeats in a row. Those detractors are probably just waiting for our next defeat, before they come out with guns blazing against the manager. We hope that’s some time away – and we are hoping we can keep this winning streak going a few more games yet. Him a chance, he at least deserves that, I imagine when you’re playing and portions of your support are belittling the management that’s guiding you it can make it really hard to get into the game and concentrate on playing positively. Although the players have done really well to keep the heads down and get the results. I hope Aarons isn’t out. Definitely our best current winger. Hate to say it but shows we aren’t missing HBA. When he is flying he is great but seems to be a distraction amd bad influence when he is off form. Pardew is just a Puppet in Mike Ashley,s Punch and Judy show ! Pardew is just a small piece of the Problem and the sooner the Pardew out brigade realizes that the better? With Pardew out another Muppet would be given the job to Punch ( or Headbutt ) Judy ?